This article was co-written by Liz Randolph, Alastair Rodd and Consilous Rwanyonga. All three plus many others worked together on the model design and implementation. Teacher absenteeism is endemic in Uganda primary schools. Teachers are, on average, absent from school 1 in every 4 days, rising to just under 1 in every 3 days in rural schools (roughly equivalent to between 70 and 100 days a year), according to te World Bank’s Service Delivery Indicator 2013. This tolerated, chronic teacher absenteeism is structural violence. It hurts children emotionally and denies them their right to education. Teacher absenteeism is complex and comes in many forms: teachers fail to show up; arrive late; arrive at school on time but do not go to class when they should. When they go to class, they do not teach all the lessons of the day. Education management tends to approach such system-wide problems in the same way generation after generation. For example, it is often believed that teachers who are chronically absent need to be sensitized about their roles and responsibilities. Closer and improved supervision of teachers is another solution that seems to resurface time and again. Training of managers about how to deal with absenteeism is also a common approach. Yet, there are often good approaches that provide managers with appropriate response to teacher absenteeism. These approaches rarely address the complex underlying factors that contribute to teacher absenteeism. There are good approaches that can provide managers with appropriate response to teacher absenteeism, but these often require an understanding of power relationships and a collective understanding and response to the causes of absenteeism. Someone once said: "If you always do what you've always done, you'll always get what you've always got" (IYAD-WYAD-YAG-WYAG). 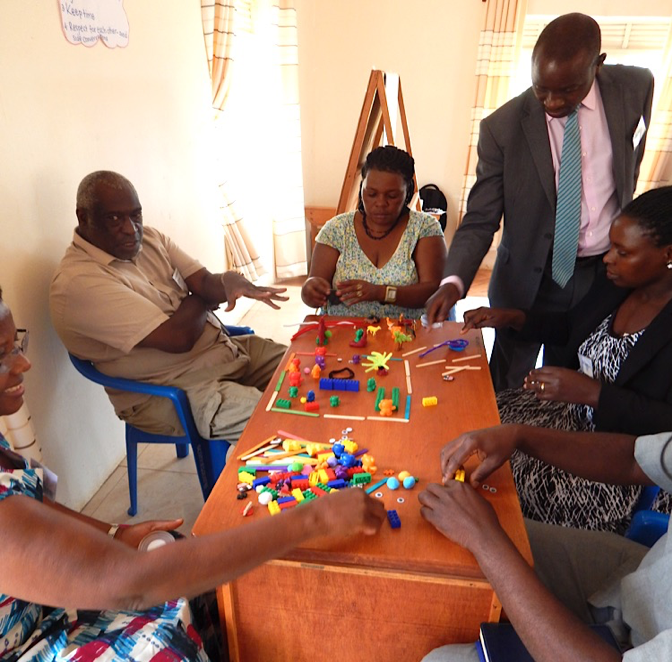 USAID/Uganda Literacy Achievement and Retention Activity is trying some new approaches to help school systems take a closer look at teacher absenteeism and to shift the status quo. --> Conversation – Engage in meaningful conversations about teacher absenteeism leading to new ideas, deeper understanding. --> Collective Action – Work with peers to plan and carry out novel solutions to improve attendance. Following the U Model, participants were involved in a Journey that began with Co-initiating/setting intent activities such as engaging participants in a personal reflection about what it is like to experience chronic teacher absenteeism as a child. (See the figure to the left). The second part of the journey was Co-sensing or learning together. During this stage of the workshop participants were engaged in a variety of activities, which helped them understand the complexity of the problem and spark some empathy for all, the teachers, managers, students and parents. The mind map ping activity was one way that participants came together to learn about the vast and inter-connected reasons why teachers are absent and why this behaviour continues. During the Presencing/quiet reflection part of the ‘U journey’ participants reflected on what they had learned in the first day of the workshop and what might be important to change in order to improve teacher attendance. This quiet reflection helped to prepare participants to begin thinking about solutions. On Day 2, the group began working together to discover new solutions, during the Co-creating/issues to actions part of the workshop journey. An adaptation of the Four Quarter Symbol Process was used to inspire participants to consider small changes in the system that could yield improved teacher attendance. Using small objects and explaining what each represented, participants modeled what teacher absenteeism ‘looked like’ in the system. Using the model as a stimulus for discussion, the group then agreed on certain changes in the system to improve teacher attendance and moved the objects to build a new model that would depict the needed system changes. Finally, the team discussed the reality that any new actions to improve a system - in this case reduce teacher absenteeism – involve strong leadership and collective action, continuous monitoring of the success of the change initiatives by the group and adaptations that will lead to institutionalized change. In the model this is the Co-evolving/evaluation and adaptation part of the journey. 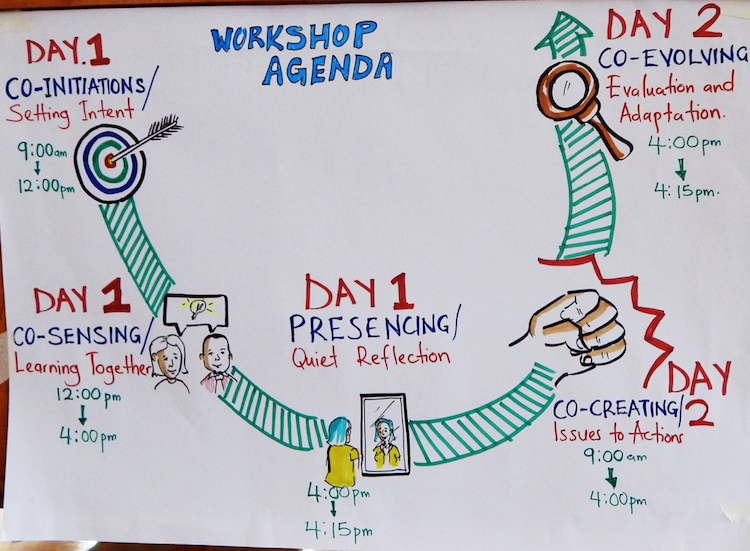 What were the actual outcomes of the two-day workshop? There were mixed results. The team is currently modifying the workshop design to improve the process in order to make a greater impact and change. Teacher absenteeism is endemic in many of the places we work. Recognizing this reality can inform expectations for scope and sequencing; materials content and the amount of subject matter that can be reasonably covered. Teacher absenteeism, as a social norm, will not be changed through traditional methods of policy and practice. A targeted behavior change strategy (similar to addressing health issues) is required. The trend to move school governance to local communities ignores traditional social and cultural hierarchies. When identifying formal reporting relationships, it is important to understand the informal relationships that individuals also bring to the system. The complex array reasons for teacher absenteeism mitigate a single systemic solution (such as supervision or orientation). Instead, providing support for small changes in local practice may provide greater opportunity for addressing absenteeism. 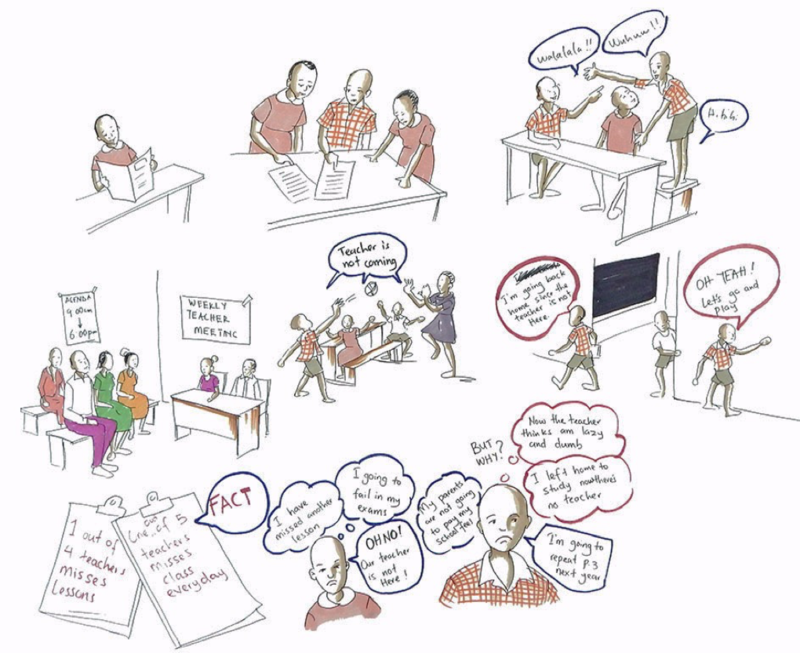 RTI also used the visual note-taking method, as illustrated by the images in this blog, including the one below! The Ugandan artist is Isaac Kabuye, an expereinced illustrator and graphic designer skilled in concept art, graphic recording, mural painting and illustration. He is also a certified graphic recorder and facilitator who describes art as "an avenue for interaction, innovation and conceptulization." Originality, honest, teamwork and quality are a few of the driving principles that he believes in. Scharmer, O. 2018. The essentials of Theory U: Core Principles and Applications. Berrett-Koehler Publishers. San Francisco, CA.